Carved in stone during the Atlantic Bronze Age (ca.1500 BC), labyrinths were popular with the Celts and appeared to be connected with ancient pilgrimage sites. 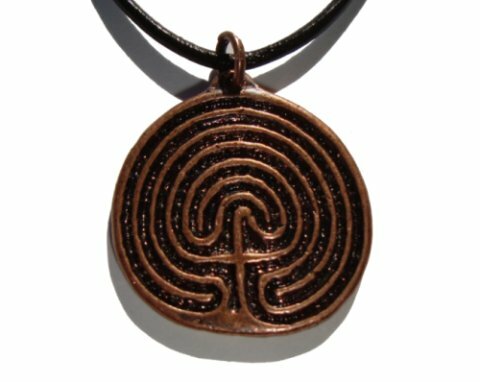 Some of the most famous "cup and ring" labyrinth carvings are found at Rocky Valley (Cornwall), Holywood Stone (Ireland), Mogor (Galicia), and Cochno Stone (Scotland). + Made with zinc alloy with an antique bronze plating. + The pendant comes with a choice of a black cotton cord or an elegant iron chain matching the bronze colour of the pendant.